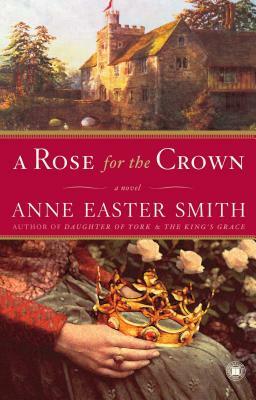 "Anyone interested in history, honor, and lost love will want to read A Rose for the Crown." "Move over Amber St. Clare! Here comes Kate Haute. The richly imagined story of the woman who might have been the mother of Richard's three illegitimate children, this tale plunges the reader into the treacherous politics of the War of the Roses." "Remarkably assured debut spins a romantic yarn around England's much-maligned King Richard III.. a delightful, confident novel that should be a favorite with lovers of the genre. A strong new voice in the field of historical romance." "In her first book, writer and musician Smith has produced a vibrant story full of careful historical detail and well-developed characters. More than just retelling historical events, Smith creates an empathetic and fascinating heroine in her own right. As Kate witnesses the monumental events that take place at the highest levels, the reader becomes engrossed in her story...highly recommended." "Anne Easter Smith has done a remarkable job of weaving contemporary sources and scholarly evidence into the romantic, touching story of Kate and Richard's abiding connection to one another. The love Kate and Richard share is almost painful in its intensity. Kate is an appealing, fully drawn character who grows and ripens as the story progresses. Smith's Richard is certainly not the vilified hunchback king who killed his nephews in the Tower, but the fiercely loyal younger brother of Edward IV and later, husband of Anne. The Author's Note, extensive and wonderful, supports the existence of Kate or a Kate prototype. This is a marvelous book, long and complex, deeply satisfying and a great read. Highly recommended." "This is a strong biographical fictionalized account of the life of Kate Bywood that provides a warmer loving side to Richard III through the tender eyes of his paramour...Kate is a fabulous heroine whose story makes for a fascinating indirect look at another perspective of Richard III." "Move over, Amber St. Clare! Here comes Kate Haute, mistress of Richard III. The richly imagined story of the woman who might have been mother of Richard's three illegitimate children, this tale plunges the reader into the treacherous politics of the War of the Roses. With Richard, Kate shares passion, regal glamour, and, in the end, partakes of the bitter cup of loss." "Anyone interested in history, honor and lost love will want to read A Rose for the Crown."